Advocating for policy change often requires taking the long view. It takes many small, incremental steps to build enough momentum to move what can feel unmovable. But ripples of advocacy for Haitian cholera victims started to gather into something bigger in recent weeks with the United Nations’ (UN) acknowledgement of its responsibility for introducing cholera to Haiti. For years there has been evidence that cholera was brought to Haiti by UN peacekeepers. UN negligence of managing waste water allowed contaminated sewage to enter one of Haiti’s main waterways, the Artibonite River. As a result Haitians were infected with cholera and many died. There were ripples of outrage within Haiti, but years went by and the UN denied any responsibility. Further ripples of documentation, exposé reports, documentaries, and personal testimonies troubled the waters. Members of Congress sent letters urging the U.S. government to take action; a Haitian law firm compiled the claims of thousands of victims and their families to demand reparations and took their case all the way to the Second Circuit Court of Appeals—a stone’s throw from the UN headquarters in New York. Then, after the release of a report from a UN special rapporteur on cholera a few weeks ago, Secretary General Ban Ki-moon admitted that the UN played a role in the outbreak. Although he did not make explicit statements of the UN’s culpability, his partial admission is crucial after five years of outright denial. Ban has promised a new set of actions to address the crisis, which many observers hope will result in much-needed funding for the UN’s water and sanitation plan for Haiti. These advocacy efforts have taken a tremendous amount of time, energy and endurance. 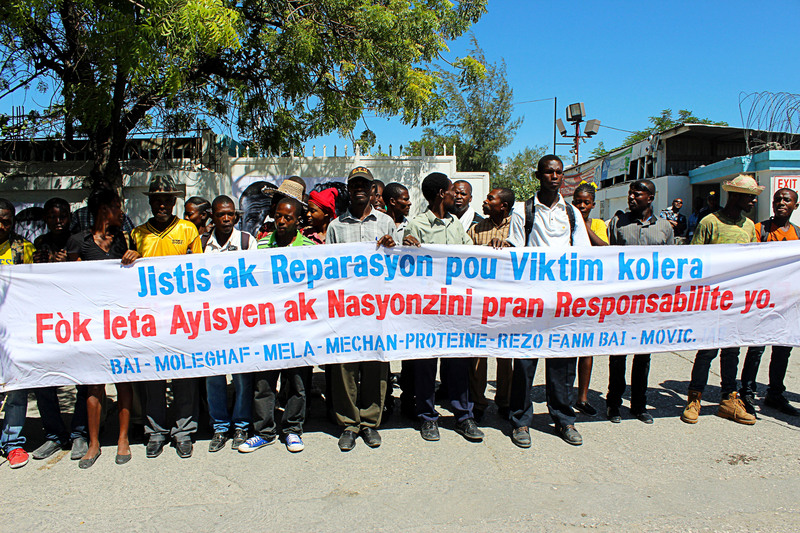 They have come from different sectors of Haitian society, along with advocates from around the world, to build a wave of support for cholera victims and efforts to eradicate the disease. Mennonite Central Committee (MCC) has supported these efforts through sustained advocacy in Haiti, Washington and at the UN. But the wave has not yet reached its pinnacle. There is much to be done to ensure that the UN will follow through with their commitments. Just as critical is the United States’ commitment to these course corrections on cholera. The U.S. has an outsized role at the UN in its influence and funding. Ensuring cholera is eradicated in Haiti and that there is justice for victims requires full support from the United States, and that has been lacking. The next important movement in this wave of advocacy is the End Haiti Cholera campaign that MCC has organized along with other human rights organizations. Launched in September, this campaign is directed at the State Department, which crafts U.S. positions at the UN. Visit facejustice.org for additional details on the campaign and the actions that faith communities and individuals can take. Let’s create a tidal wave for cholera justice! Charissa Zehr is a Legislative Associate for International Affairs at the MCC U.S. Washington Office. Story originally published on September 28, 2016. Reprinted with permission from PeaceSigns.